LAKE KAWEAH – The Cardinals performance on the courses this year has been astounding, but nothing compared to last weekend. They won both individual titles as they sweep the men’s and women’s races at the Woodlake Invitational at Lake Kaweah. “It was a real awesome day for and the kids are coming in each race with a good attitude,” Lindsay head coach Joe Dixon said. Coming off their second straight East Sequoia League win last Wednesday, Lindsay was without their top runner. McKaylie Caesar had to attend to academic responsibilities. That opened the door for Nancy Vasquez to take a leading role, and that she did as she got her first win of the season with a time of 19:12.09 minutes. 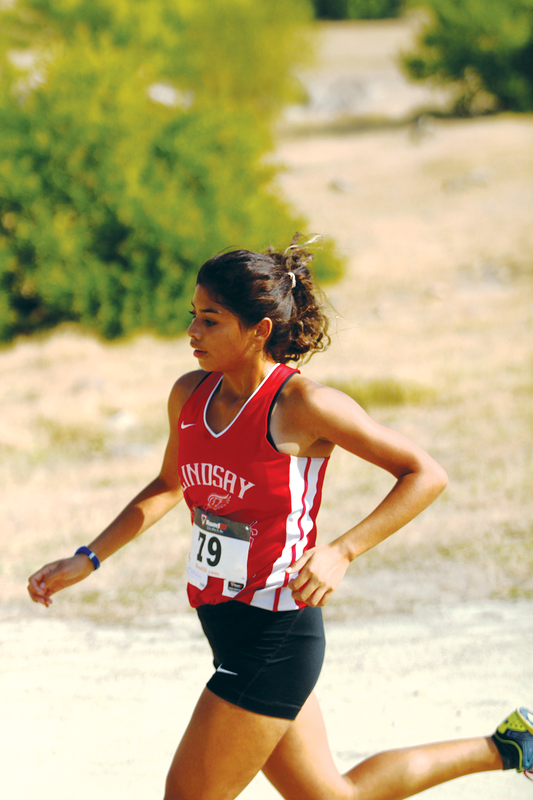 Nancy Vasquez runs the Lake Kaweah course in her first win. Photo by Patrick Dillon / @PDillon_SGN. A mile into the race Vasquez trailed Jocelyn Stansberry of Yosemite by 10 seconds, but Vasquez had time to make her move as the two runners had already distanced themselves from the main group. As the two runners reached the first hill Vasquez gained on Stansberry, and by the time the two reached the top Vasquez took the lead. By the time the runners passed back through Vasquez had built up a 23 second lead by the time the runners returned to the bottom of the first hill, and went on to win by 37 seconds. The Cardinals had a total of four girls finish in the top six positions on their way to scoring 27 points. Esmeralda Cisneros finished in fourth place with a time of 20:37.36. Briana Amador finished in fifth place with a time of 20:49.04. Belen Ferreira finished in sixth place with a time of 20:56.72. The last three runners for Lindsay finished outside the top ten. Jeanette Ramirez took 12th with a time of 22:12.55 minutes. Bianca Valdez took 15th with a time of 22:43.93. Crystal Reyes took 16th at 22:48.47. The Cardinals men’s team also saw a first-time winner this season as they swept the podium. Victor Cisneros won with a time of 16:25.02 minutes. Running right with Cisneros the entire race was Lionel Aguayo in second at 16:47.55, and Rafael Hurtado with a time of 16:48.54. This was the Cardinals second team win of the season as they scored 18 points. They won the Dinuba Invitational back in August. Cristobal Vasquez finished in sixth place at 17:20.42. Alonso Romero finished in ninth place at 17:35.51. Gabriel Maldonado finished in 14th place at 18:00.31. Ismael Ferreira finished in 15th place at 18:08.88. Host Woodlake finished in fourth place in the men’s competition with 105 points. Ricardo Navarro had the team’s best finish at 21st with a time of 18:56.20. The Tigers’ women’s team did not have enough runners to score during their race.